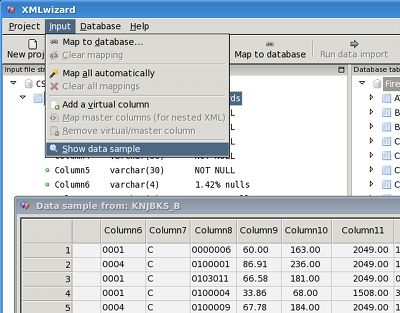 XMLwizard is a utility which can be used to load XML, CSV and flat textual files into Firebird databases. CSV is acronym for Comma Separated Values, but various forms of these files are supported (for example, TSV or Tab Separated Values), with user configurable delimiters, qualifiers and record separators. It supports multilevel XML files with unlimited depth of nesting. 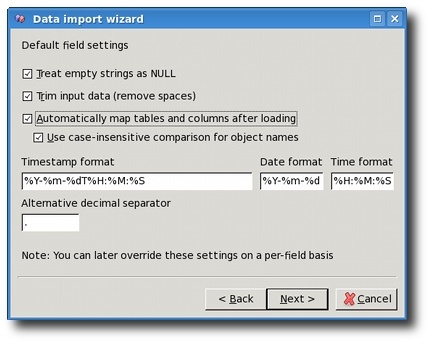 Beside importing, XMLwizard has a powerful data comparer which can be used to compare the data in input file against the data in the database and show the difference in a grid. In this grid, user can cherry-pick individual rows or even fields to be inserted, updated or deleted from the database. If everything worked the way you wanted: Congratulations! Main screen of XMLwizard has three sections. The main section on the left contains a tree representing structure of the input file. For each node, you can invoke the context menu do perform some actions. When a node in the tree is selected, its detailed properties are shown in the properties grid on the right-hand side. Some of the values are read-only, while others can be set by typing directly in the grid or selecting the value from a drop down list (fields marked with yellow color). The third section contains a tree representing structure of tables and columns in the target Firebird database. Once you start the program, a wizard is shown which will guide you through selection of source input file and target database and configuration of various options. If you cancel the wizard, you can restart it at any time by selecting the New project option. In the Server field you should enter the hostname or IP address of the Firebird server. If you are using Firebird embedded, leave the field blank. 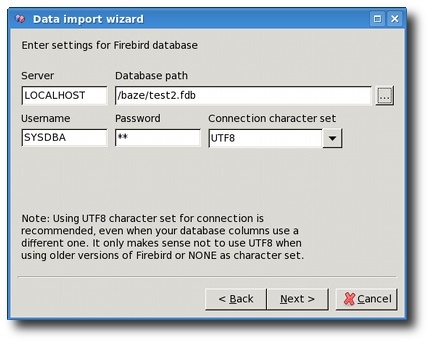 In the Database path field you should enter the path to the Firebird database on the server, or an alias if you have set it up on Firebird server. In fields Username and Password you should enter the user credentials. In field Connection character set you can select some of the character sets offered in the dropdown list, or enter a completely new one. The reason for this is that some newer Firebird versions might support more character sets, and you wouldn't have to upgrade XMLwizard to a newer version just to have that working. It is recommended that you use UTF8 character set for all connections. The reason is that this character set simply works out-of-the-box in most of the cases, because all other character sets can be converted to it. On this page you need to select the type of the input file and the file itself. Please note that memory requirements for XML files are 10 times the size of the file, because the entire file with its structure and data is parsed and loaded by a DOM parser. This means that processing at later stage works much faster. For example, if you have some XML file of 20MB, XMLwizard's parser will require about 200MB of RAM to work properly. If you are unsure which is the character set of the input file, try with ISO8859_1 or UTF8. UTF8 is a superset of ASCII so it is quite possible it will work. 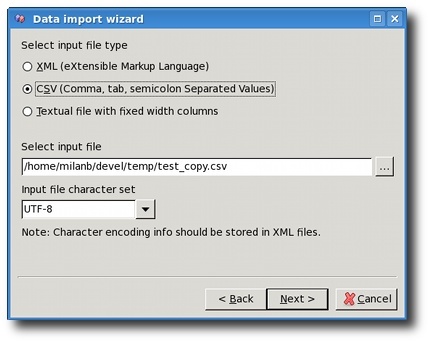 When loading XML files, the character set option is disabled because character set information is stored in XML files and the parser automatically detects it. When the option Treat empty strings as NULL is checked XMLwizard will treat all the empty fields in the input as NULL. This setting is only relevant to fields of character types (char, varchar). With dates, times and numbers it is always on. For example, empty number field always defaults to NULL and not to zero. Option Trim input data is also only relevant for character fields. For example, when strings are converted to numbers, the leading and trailing whitespace is ignored. When option Automatically map tables and columns after loading is checked, XMLwizard will look for node names in the input file and try to automatically match those to the names of columns and tables in the Firebird database. It uses table or column name for matching, and you can control whether this matching will be case sensitive or not. If you turn this option off, you can always invoke this action using the option Map all automatically from the Input menu in the main XMLwizard's window. For example, to parse ISO date representation format (31st of December 2009 is represented as: 2009-12-31), we would use %Y-%m-%d format for dates. The Alternative decimal separator setting is used when you have (for example) numeric data with comma used as decimal separator instead of dot (i.e. 123,45 instead of 123.45). This separator is called Alternative because detection of values with dot as decimal separator would still work properly even if you set the comma as alternative separator. Then semi-colon is the field delimiter and double quote is the text qualifier. CSV import also shows you a read-only preview of the first few lines of the input file, so that you can easily spot which settings to use. Please note that the preview does not change when you change the settings. It always remains the same, showing the input file as it is. Importing flat textual files assumes that you either have a file that has a fixed record length, or that records are separated by newlines. The Fixed record length setting is in charcters, to avoid potential problems with variable length character sets like UTF-8. On the other hand, the First record offset setting is an offset of the first record from the start of the input file, and it is given in bytes. The reason for this is that you might have some file with a binary data in header which you might want to skip. Since it cannot be converted into characters there is no way to count them. A usual use case for this is when importing DBF files directly. In the upper part of the screen you should setup the offsets of each field in a record. Again, this works on character basis, and WYSIWYG principle (what you see on the screen is what you get imported in the database later). Note that one of the rows can be marked if you click on it. This has no significant effect on the import process, it's only visual aid used to help you when you have really long lines in input file. To check whether the file was loaded properly, you can always preview the program's view of the data by selecting the Show sample data option in the Input menu. Please note that this dialog shows first 20 values found for each column. Therefore, if some of the fields in input file are empty or not supplied (common in XML files), this preview would not show the actual rows that would be inserted in Firebird table. 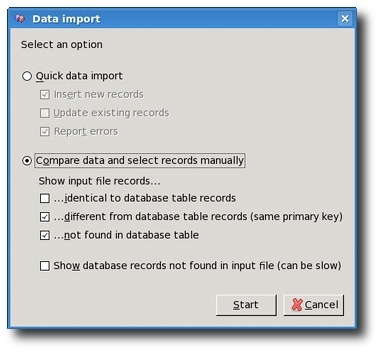 On this screen you should select whether you want to do quick data import into the database or you wish to compare the data. 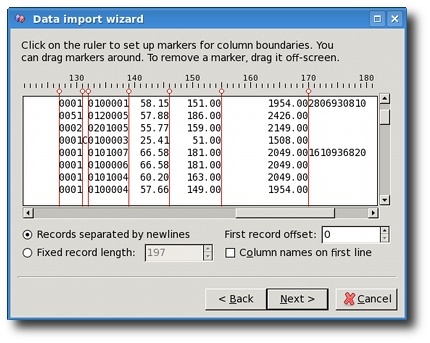 The quick data import only gives a progress bar and data is imported into the database without any prompting (except in case of errors). Many times, it is smart to first do the comparison to have a preview of what's going to happen. If both insert and update is selected then XMLwizard first tries to insert and if that fails it then tries to update without issuing an error. Therefore, selecting both options works like "overwrite" mode - adding new and updating the existing records in the database. When error reporting is turned on, the import stops at every error asking you what to do. However, you can decide to skip different kinds of errors. It is always a good idea to start with error reporting on, and turn some of the "expected" kinds of errors off during the import. Of course, if you just want a quick and dirty import for some testing purposes, it's easier just to ignore all the errors and let it run. When import is complete, the program will report number of records that were successfully imported and ask you if you wish to commit the transaction. So, you can still decide to abort if something has gone wrong. If you want to Compare data and select records manually you need to select whether you want to see the records that are the same, different (same primary key, but different values in some other columns) or not found in database table (but present in the input file). All those options require a single scan of the input file. However, the records are shown in the resulting grid in the order they are read from the input file, so you might have a hard time finding, for example, five new records in a pile of 10000 existing identical records. It's better to select to see only the new records in this case. 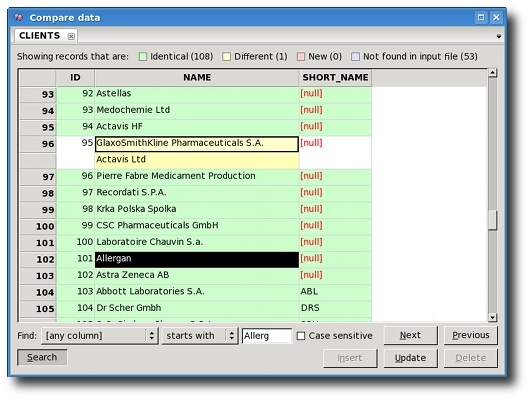 You can also select the option to see which records exist in database, but are not present in the input file. This requires a full scan of the database table, which is then checked against cache of primary keys found in the input file. If you have a lot of records in the database, this can be very slow, so it is turned off by default. Data comparer loads all the data from the input file and checks against Firebird database. If record has all the fields with the same values, it is identical. If record has same values for primary key column(s), it is different. If primary key is not found in the database table, the record is new. Additionally, comparer can read in all the records from database table and check that against the input file to see which records are not found in the input file. That option is off by default because it can work really slow if you have a lot of records in the database. On data comparer screen you can select individual cells in the table to update the value in database with the value from file. Those fields are marked with yellow color. The value in top row (light-yellow) is the value from input file, while the value in bottom row (dark-yellow) is the value from database. White cells mark the values that are same in both input file and database, but are a part of row that has different values. When all values are updated into database, both rows will be removed from the grid automatically. You can hold down the Ctrl key to mark multiple disconnected cells for update. You can also use the Insert and Delete buttons to insert new (red) cells, and delete rows from database table that are not found in the input file (blue). When multiple cells (or entire rows or columns) are selected the Insert button would only insert new rows in that selection, Update button would only update the different values in that selection, and Delete button would only delete records not found in the input file. 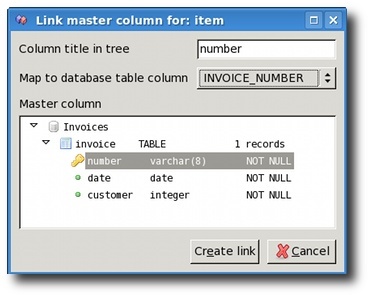 Virtual column name is the name that will be used to display the column in the input file structure tree on the left side of the main screen. You can use any name you like. 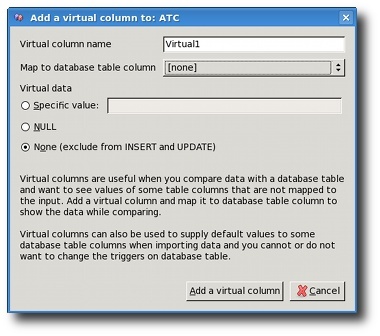 Database table column mapping maps this virtual column to some database table's column. This option is only enabled when the parent input node is already mapped to some table. You can also set or change this mapping later, after you add the virtual column. Type of Virtual data can be a specific value, NULL or None. Specific value can be something like "10", "abc", "2009-05-02", etc. The string you type is treated the same way as if it were extracted from the input file. NULL is treated like the field's value is not supplied in the input file. 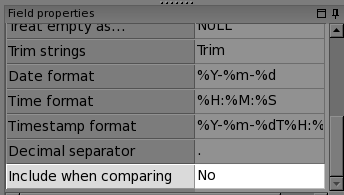 None is used when you want to see some table column's values in the compare dialog, but you don't want to use this virtual colunn while importing records. When you create a virtual column having Specific value or NULL, and you map it to the database table's column, that column will be set to Specific value or NULL when records are imported. Database column's values will also be compared against Specific value or NULL when comparing data (unless you set Include when comparing setting to No in field properties grid). When you create a virtual column with data set up as None, it will only be used when comparing. It would not compare database column's data to anything, but rather just display it on the screen. This is useful when you need some columns from database to have a proper context while comparing, but those columns are not present in the input file. In the above example, invoice number is needed in order to insert records into invoice_item table. However, since it is a nested XML file, that data is not found at the same level. XMLwizard enables you to create a link to any value which is above in the hierarchy by using Map master columns option in the Input menu. You can also use the context menu of the input tree node to get the same option. XMLwizard supports unlimited depth of nesting, so you can reference fields that are more than one level up in the hierarchy.